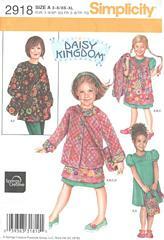 Simplicity 2918 Daisy Kingdom includes patterns for both Misses and Girls. Girls' dress, jumper, jacket and purse. Girls' Sizes 3, 4, 5, 6, 7 and 8 are all included. Misses' Sizes XS (6-8), S (10-12), M(14-16), L(18-20) and XL(22-24) are all included.